Get the answers you need to effectively implement IFRS rules and keep up to date on the latest IFRS requirements. Designed to complement any Wiley IFRS product, IFRS Policies and Procedures is sequenced in the same manner as Wiley IFRS and incorporates additional categories of information to assist you in properly implementing IFRS, covering all current IAS, IFRS, SIC and IFRIC guidance in depth. 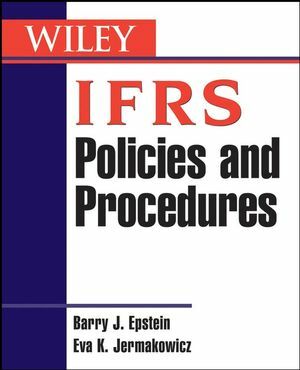 Barry J. Epstein, PhD, CPA, a leading consulting and testifying accounting and auditing expert, is coauthor of the Wiley IFRS and Wiley GAAP annual publications. He is a partner in the Chicago firm Russell Novak & Company. He has forty years' experience in the public accounting profession as auditor, technical director/partner for several national and local firms, and regularly serves as an accounting, auditing, financial reporting, and financial analysis expert in litigation matters, including assignments for both private sector entities and governmental agencies. Eva K. Jermakowicz, PhD, CPA, is coauthor of Wiley IFRS and a leading consultant to international organizations and businesses. She is a frequent speaker at international venues and has taught accounting for twenty-five years. She is currently Professor of Accounting and Chair of the Accounting and Business Law Department at Tennessee State University. 1. Researching IFRS Implementation Problems. 2. Cash, Receivables, and Prepaid Expenses. 3. Short-Term Investments and Financial Instruments. 8. Business Combinations and Consolidated Financial Statements. 9. Current Liabilities, Provisions, Contingencies, and Events After the Balance Sheet Date. 12. Pensions and Other Postretirement Benefits.